The key targets are multi-purpose observations designed to efficiently address the broad-ranging science questions of CTA’s study themes. Brief summaries are provided below but are expected to evolve before implementation due to developments in theoretical understanding and new observational insights. 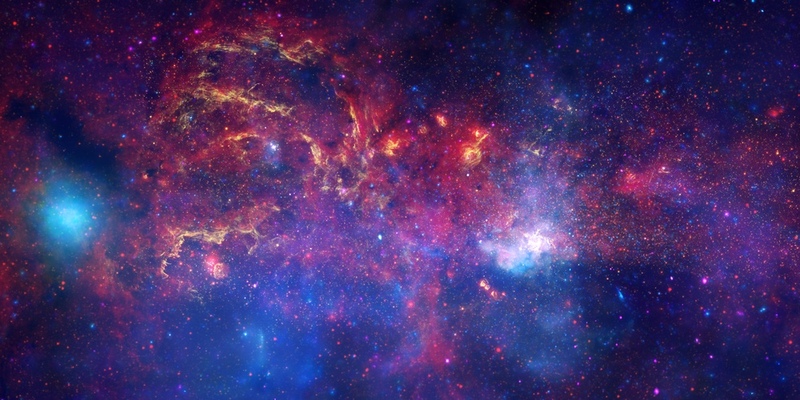 The region within a few degrees of the Galactic Centre (GC) is rich with a wide variety of high-energy emitters, including the closest supermassive black hole, dense molecular clouds, strong star-forming activity, many supernova remnants and pulsar wind nebulae, arc-like radio structures, as well as the base of what may be large-scale galactic outflows. 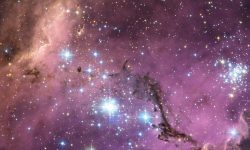 It is arguably one of the most studied regions of the sky in nearly every wavelength and has some of the deepest exposures with other major observatories (for example, Chandra and Spitzer). 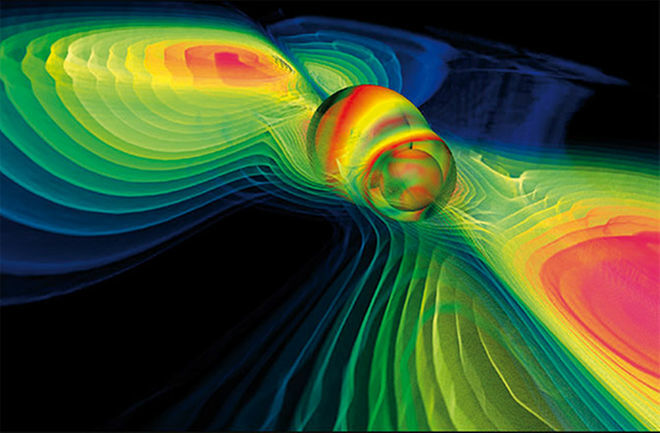 To the rich existing picture of the region, CTA will add precise measurements at the highest energies to more accurately investigate the properties of the central source (which is coincident with the supermassive black hole Sgr A*), characterize the spectrum and morphology of the extended emission and probe the population of astrophysical particle accelerators in the region. A deep observation of the GC region with CTA will provide significant science output on a variety of topics and will serve as a legacy data set for a wide scientific community. In addition to the rich astrophysical possibilities, the GC region is the prime target for the CTA search for the annihilation signature of dark matter particles. 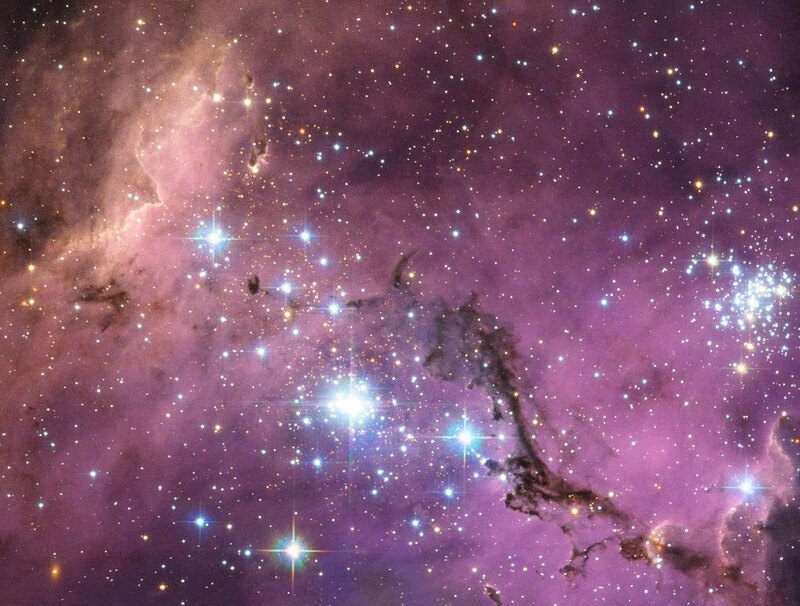 The Large Magellanic Cloud (LMC) is a unique galaxy hosting several exceptional objects, including the star-forming region 30 Doradus, the star cluster RMC 136, the remnant of supernova SN1987A and the puzzling 30 Dor C super-bubble. 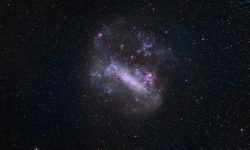 As a satellite of the Milky Way, it is one of the nearest star-forming galaxies and is very active, with one-tenth of the star formation rate of the Milky Way, distributed in only about two percent of its volume. 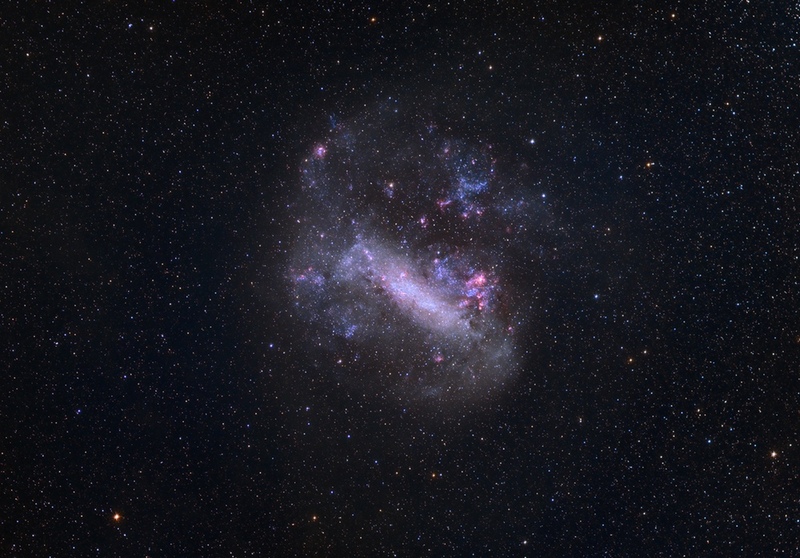 This activity is attested by more than 60 supernova remnants, dozens to hundreds of H II regions (clouds of luminous interstellar gas), bubbles and shells observed at various wavelengths in the LMC. 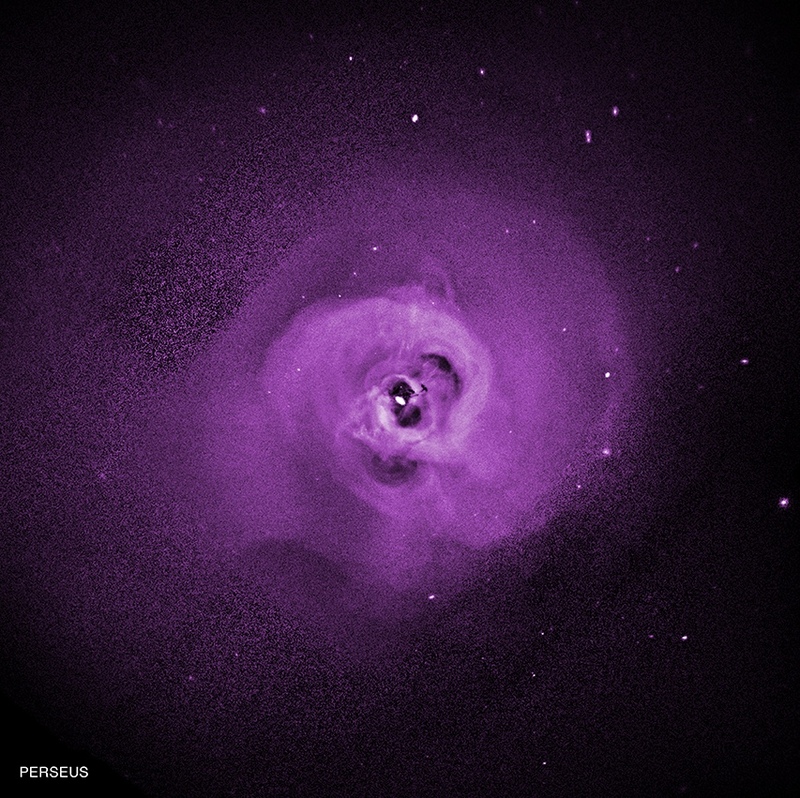 The current Fermi-LAT and H.E.S.S. instruments have revealed a small number of sources, some of uncertain nature. 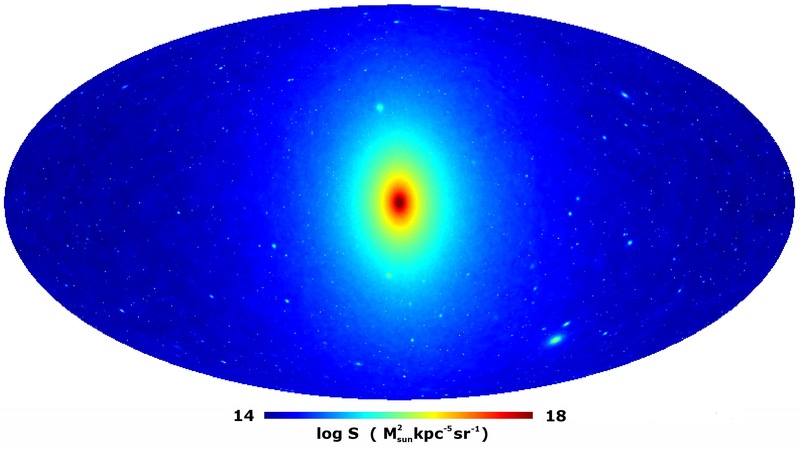 CTA will explore further and deeper, covering the entire LMC and permitting the probe of the population of VHE emitters in a galaxy and its connection to global galaxy properties. 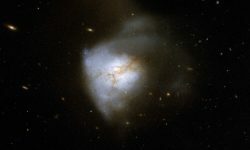 Observations of this star-forming galaxy will address many CTA science objectives: population studies of supernova remnants and pulsar wind nebulae; transport of cosmic rays on large scales — from their release into the interstellar medium to their escape from the system; and the search for a signature of dark matter. Discovery of new and unexpected phenomena in the galaxy, such as new source classes and new types of transient and variable behaviour. Detection of hundreds of new VHE galactic sources, particularly pulsar wind nebulae and supernova remnants, to substantially increase the galactic source count and permit the first high statistics population studies. 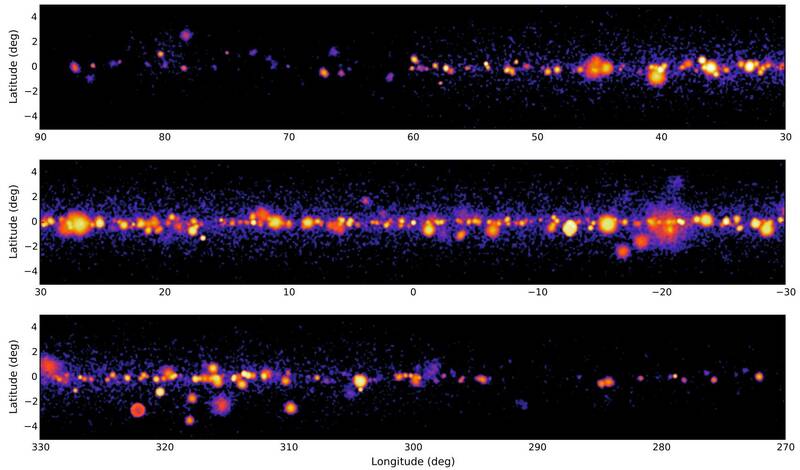 Discovery of new VHE gamma-ray binaries and PeVatron candidates. 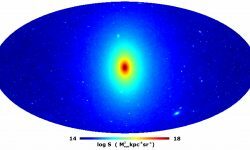 Production of a multi-purpose legacy data set, comprising the complete Galactic Plane at VHE, tracing diffuse emission as well as discrete sources. 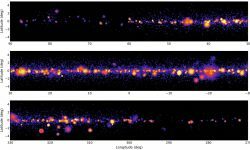 The CTA plane survey will be uniform, comprehensive and much deeper than any previous gamma-ray survey, making it key to the scientific strategy for CTA. 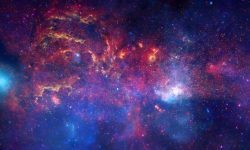 Read more about CTA’s galactic plane survey. 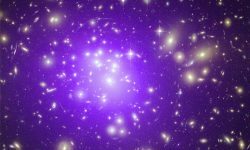 Galaxy clusters are expected to contain substantial populations of cosmic-ray (CR) electrons and protons accelerated by structure formation processes and by member galaxies and active galactic nuclei (AGN). The detection in several clusters of diffuse synchrotron radio emission confirms the presence of CR electrons and magnetic fields permeating the intra-cluster medium (ICM). 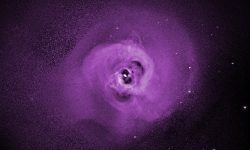 CR protons and nuclei may play an important role in the suppression of cooling flows in galaxy clusters, and while no direct proof for the existence of these particles in clusters exists yet, gamma rays can provide such proof unambiguously. CR protons can produce significant high-energy gamma-ray emission through interaction in cluster gas and subsequent pion decays. Clusters typically host hundreds of galaxies, some of which may be detected individually (due to AGN and/or star-formation activity). 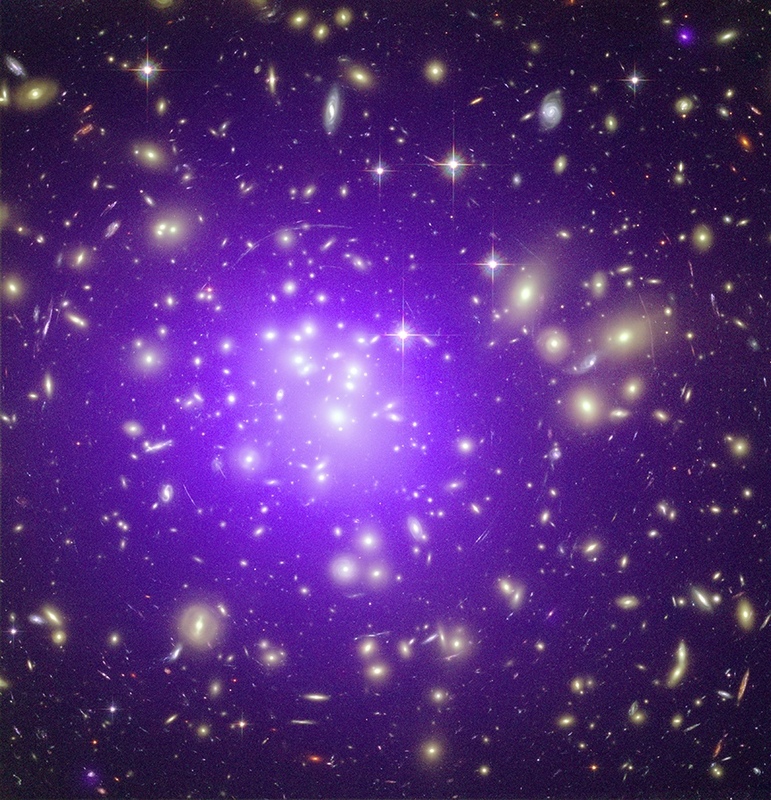 Additionally, about 80 percent of the mass of clusters is in the form of dark matter (DM), making galaxy clusters a natural target for indirect DM searches. 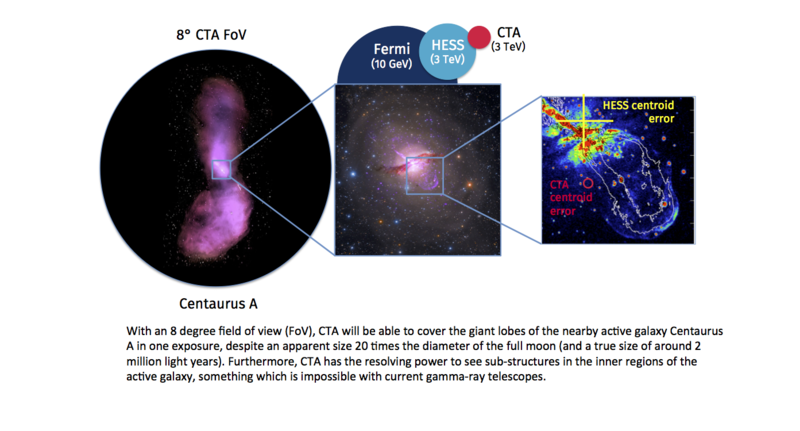 CTA will be able to detect diffuse gamma-ray emission from one of the nearest galaxy clusters, Perseus, or set stringent limits on the CR proton content, triggering a substantial revision of the current paradigm of proton acceleration and confinement in galaxy clusters. Additionally, due to the large mass of this cluster, CTA can significantly improve the constraints on decaying dark matter models with respect to those of Fermi-LAT from the Galactic Halo. The energy spectrum of cosmic rays (CRs) extends without any major feature until particle energies of a few PeVs, where it steepens into a feature called the knee. This implies our galaxy hosts PeVatrons – extreme particle accelerators that can reach such PeV energies. However, the only known PeVatron found so far – located in the Galactic Centre and possibly connected to the supermassive black hole Sgr A* – does not provide enough power to explain the entirety of the CRs arriving on Earth. Thus, more galactic PeVatrons are yet to be found. The discovery of such objects is key to solving the century-long puzzle of the origin of galactic cosmic rays. The CRs accelerated by these PeVatrons interact in the interstellar medium producing gamma rays, which provide a powerful probe to search for such accelerators. 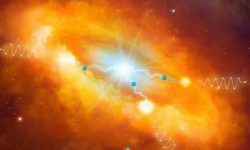 The recent advances of ground-based gamma-ray astronomy, thanks to observations of Atmospheric Cherenkov Telescope Arrays, have resulted in the discovery of tens of galactic particle accelerators reaching tens of TeV energies. Most notably, shell-type supernova remnants (SNRs) are commonly believed to supply most galactic cosmic rays. However, the identification of PeVatrons demands an energy spectrum extending beyond a few tens of TeV. This is particularly challenging for current Cherenkov telescopes, which run out of statistics in the ~10 TeV energy domain, but is well within the reach of CTA. Thus, CTA is proposing to perform deep observations on known sources with a particularly hard spectrum and/or with hints for a possible spectral extension in the multi-TeV energy domain without any indication of a cutoff or a spectral break. Some of the proposed targets include diffuse gamma-ray emissions from the vicinity of prominent SNRs and massive stellar clusters. 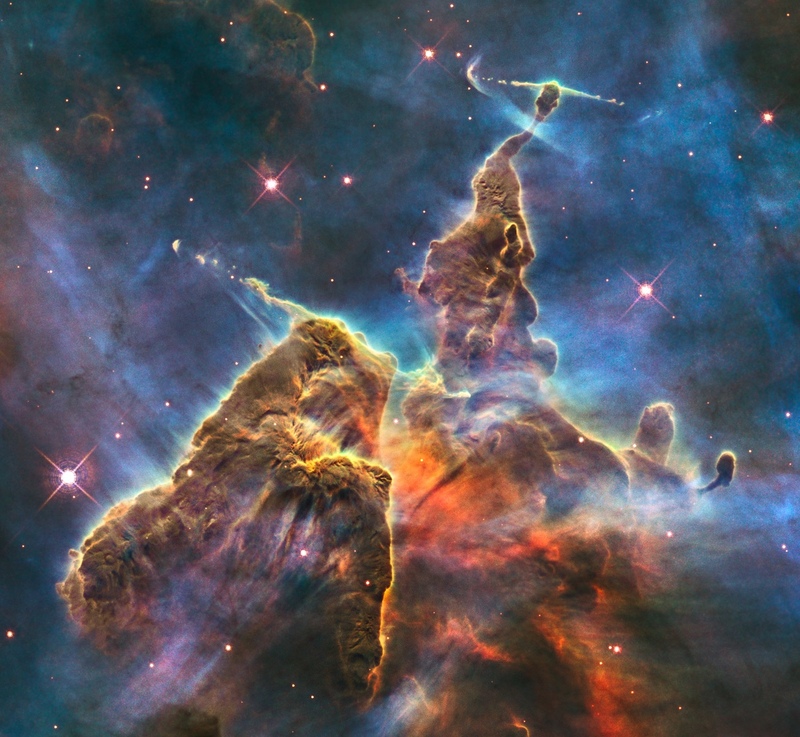 Cosmic rays may play a major role in the regulation of the star-formation process, so it is important to understand where they are accelerated, how they propagate and where they interact in the interstellar medium. 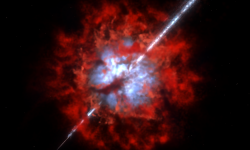 Gamma rays are a powerful tool to study cosmic rays in star-forming environments, and CTA observations of star-forming systems over six orders of magnitude in star-formation rate will help to reveal the relationship between high-energy particles and the star-formation process. 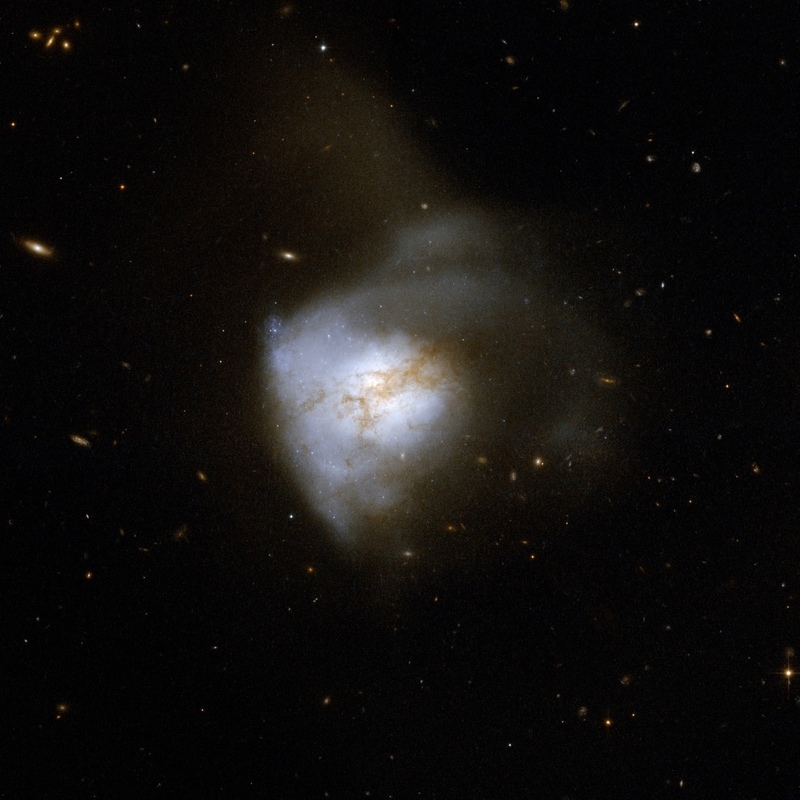 The study of individual star-forming regions and star-forming galaxies will furthermore help to disentangle source-specific properties from global properties. By studying the gamma-ray emission in these systems, we can measure the fraction of high-energy particles that interact as a function of star formation rate and, hence, investigate to which extent cosmic rays, magnetic fields and radiation are in equipartition. 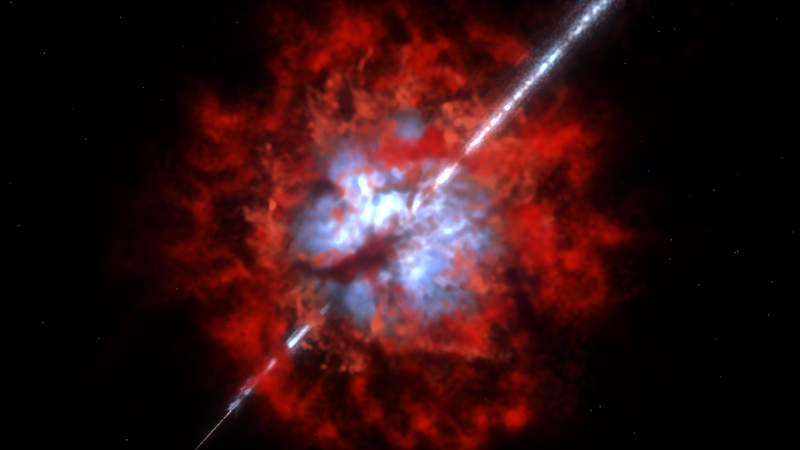 Deep observation of several different objects are required to investigate the relationship between star formation and gamma-ray emission and to study the impact of cosmic rays on their environment. 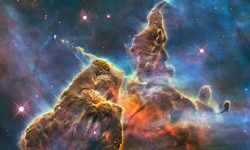 The proposed targets include star-forming regions (the Carina nebula, Cygnus region and the Westerlund 1 stellar cluster), star-forming galaxies (Andromeda/M 31), starburst galaxies (NGC 253 and M 82) and ultra-luminous infrared galaxies (Arp 220). 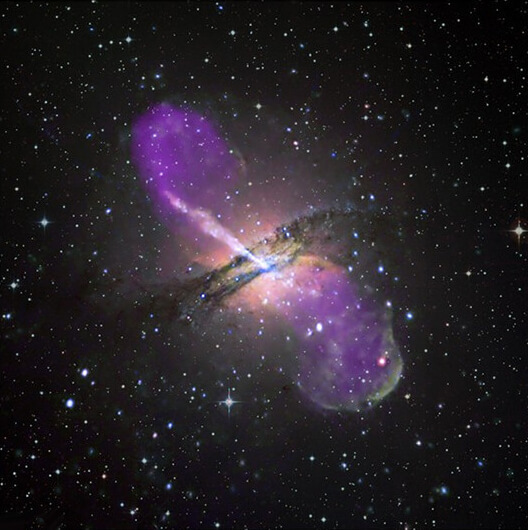 Galaxies hosting an actively accreting supermassive black hole are amongst the most luminous objects in the extragalactic sky and emit time-variable radiation across the entire electromagnetic spectrum up to multi-TeV energies, with fluctuations on time-scales from many years down to a few minutes. These objects contribute a substantial fraction of the electromagnetic energy output of the Universe. 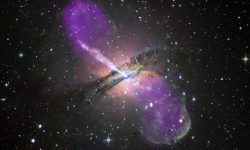 Feedback from the active galactic nucleus (AGN) is believed to significantly influence the evolution of the host galaxy and even galaxy cluster. It is in the TeV band that some of the most dramatic variability is seen, providing information on the very heart of the AGN. 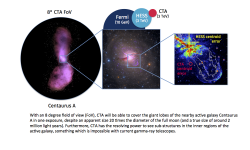 A programme of regular and externally triggered CTA observations of radio-loud AGN, in particular blazars and radio-galaxies, will provide an unprecedented data set that is not only directly relevant to the physics and phenomenology of AGN, but also to gamma-ray cosmology, to the study of cosmic rays and to fundamental physics. 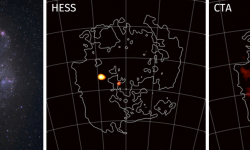 In particular TeV blazars can be used as a probe of cosmic voids and of space-time. AGN will be the main source class detected in proposed blind survey of one-fourth of the extragalactic sky in the energy range from 100 GeV to 10 TeV. The proposed survey area connects to the Galactic Plane with the objective to construct an unbiased very-high-energy (VHE) extragalactic source catalogue with an integral sensitivity limit 200 times lower than the flux of the Crab Nebula at these energies. It will be the first time that such a large portion of the sky is observed uniformly in this energy range with a sensitive instrument and will allow an unbiased search for new source classes. The Universe hosts a diverse population of astrophysical objects, within our galaxy as well as beyond, that explode, flare up or intensify activity in dramatic and unpredictable fashion across the entire electromagnetic spectrum and over a broad range of timescales spanning milliseconds to years. Collectively designated “transients,” many are known to be prominent emitters of high-energy gamma rays and are also likely sources of non-photonic, multi-messenger signals such as cosmic rays, neutrinos and/or gravitational waves. 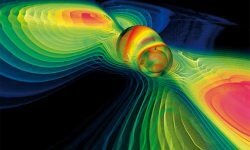 They are of great scientific interest, being associated with catastrophic events involving relativistic compact objects such as neutron stars and black holes that manifest the most extreme physical conditions in the Universe. One of CTA’s greatest strengths is its unprecedented sensitivity in VHE gamma rays for transient phenomena and short-timescale variability — far greater compared than satellite-based instruments such as Fermi-LAT. Hence, CTA has potential to break new ground in elucidating the physics of cosmic transients and, with its relatively large field of view, following up alerts of transient events issued by monitoring instruments, as well as discovering transients on its own. The proposed targets comprise six classes of objects: gamma-ray bursts, galactic transients, neutrino alerts, gravitational wave alerts, selected optical/radio transient factory events and serendipitous VHE transients, along with a VHE transient survey.